Ready for some water fun, kids? 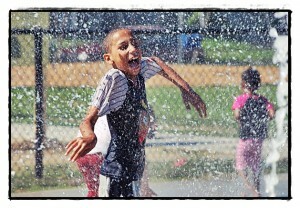 The Recreation Department’s new splash pad is up and running … but there’s a catch. It’s only open from 4:30 p.m. to 8:30 p.m., Monday through Friday, and 11 a.m. to 6 p.m. on Saturdays. Sunday hours have yet to be determined. A call to Recreation Director Craig Daniels to explain management’s decision to not allow the community to use the pad during the heat of the day went unanswered. In the past, Daniels told The Review he doesn’t have to answer any questions about the splash pad, which cost taxpayers $115,000. A Review reporter went to the splash pad at Pulaski Park on Monday at about 2 p.m. when temperatures hovered in the 80s and the humidity was thick in the air. A group of about 50 kids sat under the shelter, doing nothing, as water gushed out of the splash pad sprays. Asked if there was water for the kids to cool off with, a seasonal employee at the park told The Review that there are sprinklers available for the kids to run through. Much, much safer than running the streets, and more fun too! I think it’s ashame that kids can’t be kids and they wonder why they’re so many juveniles running around.. I Love this Park..Its a Family Park.